Being part of Geek/Nerd culture I was hesitant to read Geekerella because of how we would be portrayed. I felt the book didn’t really do much with it in the end and it was just a cute adorable read. I give Geekerella by Ashley Poston four out of five hearts. There wasn’t much wrong with the novel but it lacked in certain areas, but that didn’t take away from my enjoyment. 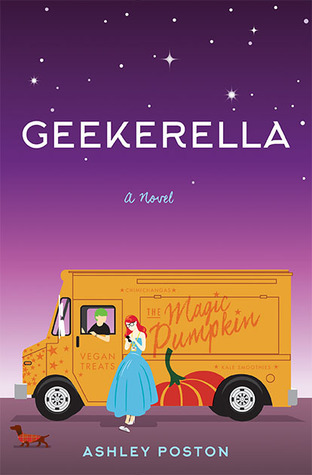 Geekerella is a geeky cinderella retelling, the girl with the horrible stepsisters and mom and the prince that saves her in the end. But this time has one of the sisters a redeption arc, which was interesting. I wish Ashley had done more with it, because it only happened in the last quarter of the book and then nothing really gets done with it anymore. I wouldn’t really call this novel a romance novel, but I just can’t find other genre I want to put this under. Because the real romance only happens in the last bit of the book. Some of the novel is written through text messages Darian and Elle, the main characters, send each other without knowing who the other is. Darien is cute, his image is this super buff jerk, but inside he is the cutest dork ever. His agent/father is only in it for the money, and that over shines anything Darien portays. Geekerella is a quick read and it is pretty fast paced, which I liked. I read it all in just a couple of hours one evening. This entry was posted in Book Review and tagged Ashley Poston, Book Review, Contemporary, Romance, Science-Fiction. Bookmark the permalink.